When naturalist guides Erick Camacho and Jose Garro found the dead toucan below a tree near their staff housing at the Costa Rica eco-lodge where they work, it was an interesting discovery but just another day in the jungle. However, the deceased toucan â€" or more importantly, its beak â€" has given a big boost of hope to saving â€œGreciaâ€ the injured toucan in Costa Rica that had its beak mutilated by teenagers late last year and has become an international sensation as engineers and veterinarians try to design a prosthetic beak for the bird. In December 2014, the young male toucan was brought to the Zoo Ave animal sanctuary and rescue center in Alajuela, Costa Rica, after being attacked and having most of its upper beak hacked off. It was named â€œGreciaâ€ after the town where it was found. Costa Rican news media quickly covered the story and images of the disfigured toucan flxedia networks. Outraged people banded together on a campaign to provide the bird with a prosthetic beak. An Indiegogo campaign by Luciano Lacayo in the Netherlands has raised $10,449 so far (more than double his original goal) to pay for costs in treating Grecia the toucan, and to now expand the hospital at Zoo Ave that treats injured wild animals in Costa Rica. The incident even spurred Costa Rican President Luis Guillermo SolÃ­s to push forward an animal cruelty bill for passage by lawmakers. A number of Costa Rican companies are working to design the prosthetic beak using 3-D printing, but so far have not been 100% successful. Not having a detached real toucan beak to analyze to see how it works has hindered progress. Until now. On July 14, the manager and guides of Playa Nicuesa Rainforest Lodge, in southern Costa Rica, donated the beak of the dead toucan they found to Zoo Ave for its research. The dead bird was found mostly eaten â€" by another jungle animal during the night â€" leaving only the head, beak and feathers intact. â€œWe were thinking about drying the beak to put it in the little Natural History Library/Museum at the lodge and I remembered a journalist friend had covered the story of Grecia. I called her to ask about the toucan and she put me in contact with Guisella Arroyo at Zoo Ave, who told me that they had been seeking a toucan beak in order to study the internal anatomy because up until now they only knew the external structure,â€ commented Luis Marcelo Lopez, resident manager of Playa Nicuesa Rainforest Lodge. â€œIt was a great contribution since they will be able to thoroughly study the internal anatomy of the beak of the toucan, and hopefully find ways to manufacture a prosthesis for Grecia,â€ Lopez said. 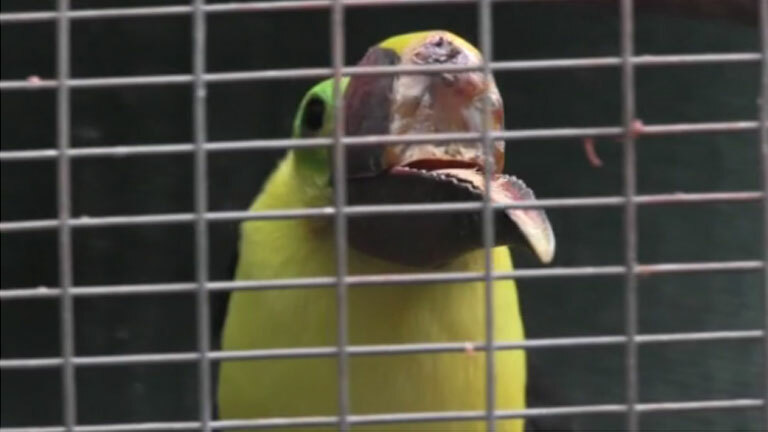 Lopez happened to be flying to San Jose the day after the beak was found and personally brought it to Zoo Ave, where he met Grecia the toucan and his doctors, and was interviewed for the Discovery Channel documentary being made about the entire story. Although he is still awaiting his new beak, Grecia the toucan is reported to be healthy and sociable at Zoo Ave, where he is well looked after. Demonstrating the resilience of nature, he has adapted to his life without the top half of his beak and uses the lower half to scoop up mashed fruit and gulp it down like a pelican. Still, without a beak, Grecia cannot return to the wild. Toucans need their beaks to forage for food, eat, regulate body temperature, attract mates, and defend themselves against predators. Hopefully the death of his toucan cousin in southern Costa Rica will be the gift of life for Grecia. Whatever happens, Grecia has become a symbol for animal protection and hope around the world. Here is more on his story. Grecia's Story from Robert Isenberg on Vimeo. To visit Playa Nicuesa Rainforest Lodge in Costa Rica, one of the first sustainable tourism eco-lodges in Costa Rica, contact their reservations agents.